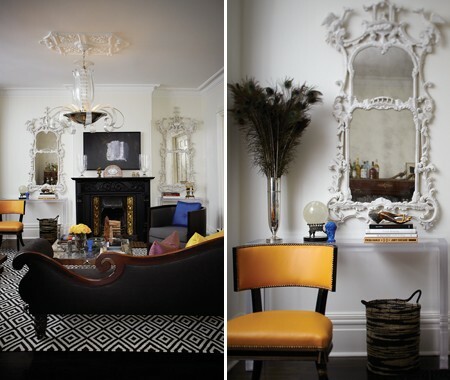 Mix and Chic: Home tour- A tailored and timeless Victorian makeover! Home tour- A tailored and timeless Victorian makeover! 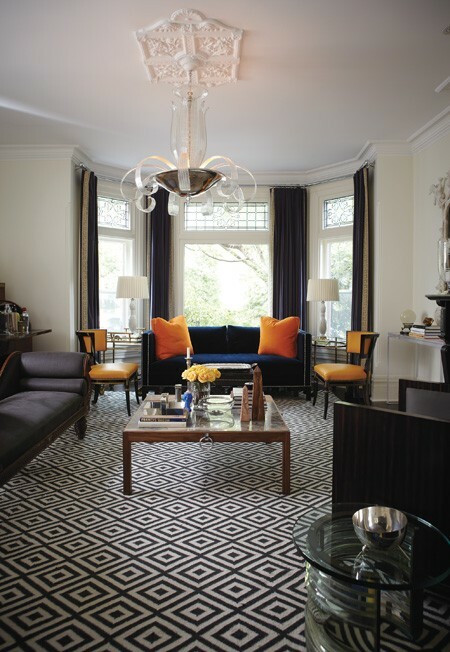 Toronto designer and HGTV star, Tommy Smythe needs no further introduction. 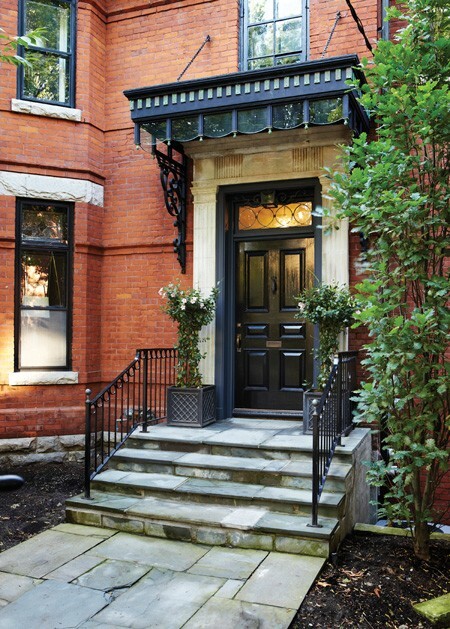 In this design project, he successfully revived this historic Victorian with his tailored and trendy approach with what he calls a "new Victorian" look. The results? A timeless look that will never go out of style. Let's take a look at this beautiful home below. Stylishly decorated with a mix of mostly classic pieces with a few modern pieces and layered with bold geometric patterns with pops of color, this eclectic Victorian home looks elegant and fresh at the same time. I am particularly drawn to the beautiful kitchen, the sitting area and the bedroom. What about you? Do you have a favorite room as well? What are your thoughts on Tommy's play on pattern? Do you find it refreshing or too bold for your taste? I would love to know. love , love, love the bedroom area rug! I'm a big fan of Tommy and had the distinct pleasure of meeting him in person. Love the sight lines in the last image! What I like best in this house is the open spaces and the high ceilings! I think this home is amazing and designed to perfection. It's so sophisticated, yet has wonderful elements to show it doesn't take itself to seriously. For example- the red chair in the kitchen...love it! I love all of the rooms, but I was in love as soon as i saw the outside...gorgeous! I happen to love the kitchen...that floor is amazing! The windows are so beautiful and the staircase with the collection of mirrors...stunning, of course! Love the open spaces and pops of color! Bold but great. I especially like the room with the grass cloth wall coverings and the chevron panels. Goodness gracious this home is beautiful! I just found your blog and couldn't be more thankful- I am utterly obsessed! Your design, your aesthetic- I love it all! Excited to be your newest follower. Well now that was some update of a Victorian. 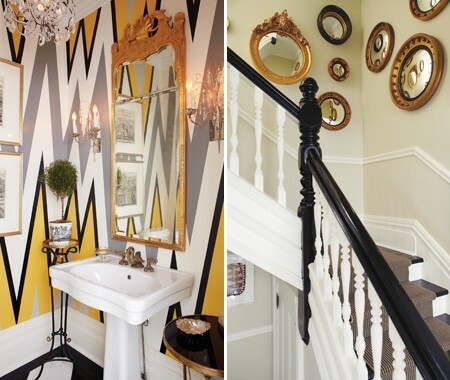 Love the fun and sophisticated look he gave to the rooms...especially loving the chevron!! He is just adorable - and obviously a fan of the zigzag! I love his style - he pushes it - but not too far. This home has tons of personality! I like bold but not too much bold. I think I would get tired of such extremes. He did do an incredible job! Now that's a Victorian update with ATTITUDE, it's FAB! 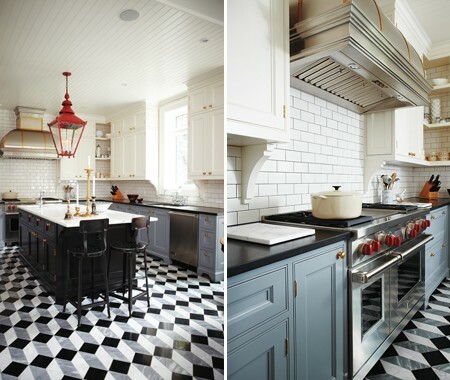 The flooring in the living room and kitchen-diner is so bold! Tommy is the bomdiggity huh???? I love every thing he does. wow, love it . The bathroom wall design is very original!